Posted by Bill Mann on Wednesday, December 19th, 2012 at 9:51am. The National Association of Home Builders (NAHB) released its Housing Market Index (HMI), showing another monthly gain -- its ninth in a row. The HMI -- a gauge of homebuilder confidence -- rose 1 point to 47 in December 2012, lifting the index to its highest levels since April 2006. Readings under 50 indicate unfavorable housing conditions for builders. Readings over 50 signal "good" conditions. Coincidentally, the last time that the HMI read above 50 was April 2006, too. The Housing Market Index is based on a survey which the NAHB sends to its members. The survey asks the nation's builders to rate the current housing market conditions. It's noteworthy that buyer foot traffic has climbed over nine straight months and is now at it's highest reported level in nearly 7 years. Low mortgage rates and rising Rehoboth Beach home prices have compelled today's renters and existing homeowners to consider their home buying options. For today's buyers, rising builder confidence may be a signal that home prices are headed higher. Confident home sellers -- including the nation's builders -- are less likely to make price concessions into an improving market, or may be less likely to offer free upgrades to buyers. Therefore, if you are in the market for a newly-built home, consider that you may get the best "deal" by acting sooner rather than later. Mortgage rates are rising and home prices are, too. Six months from now, your costs of home ownership may be higher. 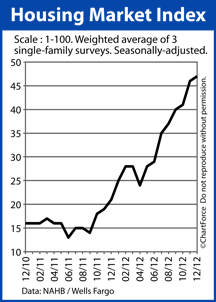 2 Responses to "Homebuilder Confidence Rises For 9th Straight Month"
Posted on Tuesday, February 5th, 2013 at 10:46pm. Posted on Thursday, April 18th, 2013 at 12:57pm.